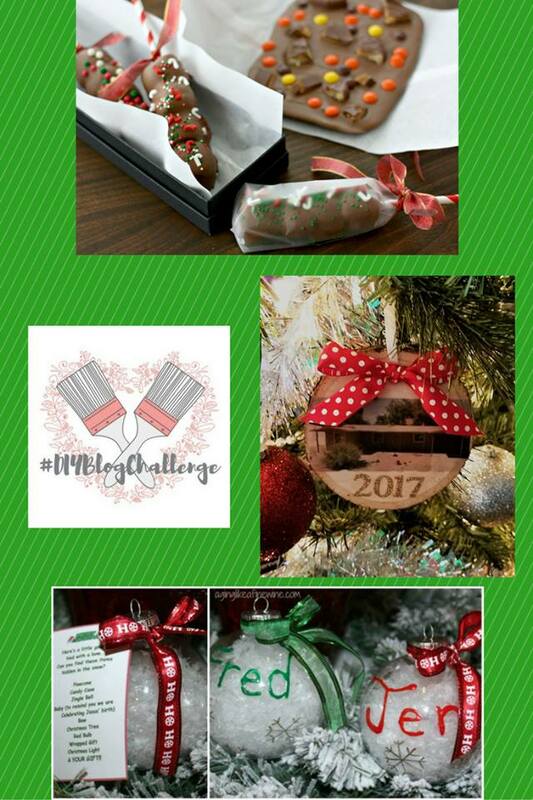 How To Make Your Gift of Cash a Fun Experience this Holiday Season – DIY Blog Challenge! It’s so easy to buy gifts for our children when they’re little. It’s all about the toys! My grandchildren have browsed through the toy catalog from Toys-R-Us so many times that almost every toy in the book has been circled now. But as everyone knows it gets more difficult as they get older. And as for the adults, at least in my family, they usually want a gift card from somewhere. I decided to send a gift of cash to my daughter, son-in-law, and grandchildren in California, but I wanted to package it in some way that would be fun and they would have to work to get their money out. I came up with an idea to usesome of those wonderful clear plastic ornaments available at craft stores and Walmart this time of year. 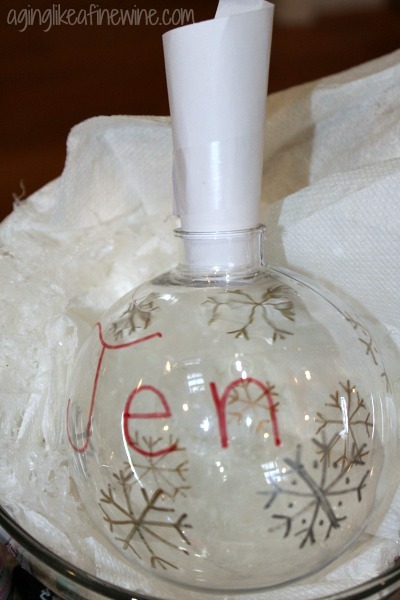 Using the permanent markers I drew very basic snowflakes all over the ornament, leaving room to write the name of the recipient. I used either the red or green marker to write the recipients name. I filled the ornament halfway full with the fake snow. 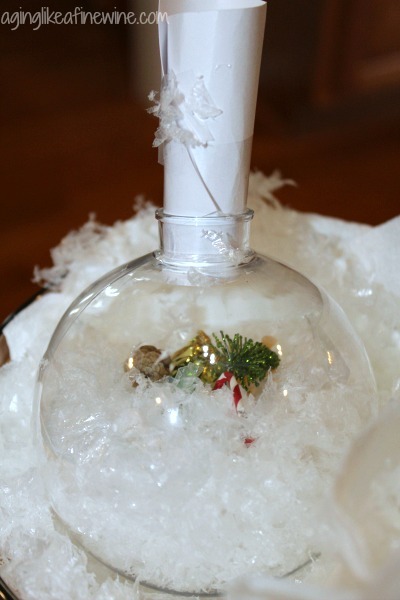 To do this I made a funnel out of cardstock that was the perfect size to fit the opening in the ornament. I have plastic funnels in my kitchen, but I found the openings in them to be too small. It would have taken a long time to get the snow in! 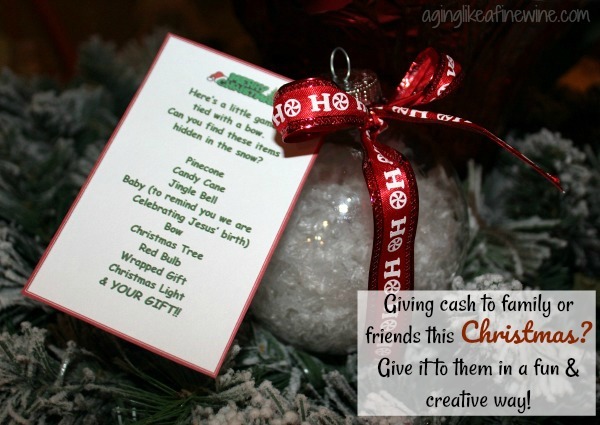 Fold the cash into a small size and drop it in, then fill the rest of the bulb with the fake snow. Put the silver top back on the globe. 6. 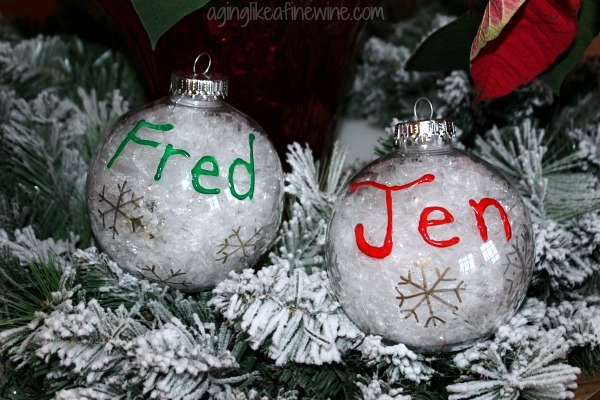 Apply the puff paint over the name of the recipient in the same color you wrote their name in. 7. Allow the puff paint to dry really well. 8. Tie a ribbon around the neck of the ornament. 9. 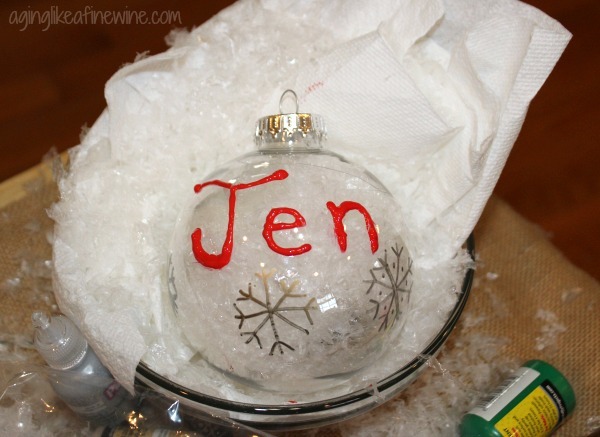 Add a hook to the top of the ornament so the recipient can hang it on their tree until Christmas morning! baby (to symbolize baby Jesus) – I found this in the baby shower section at Walmart. pinecone – I found tiny little pinecones when out for a walk last summer and kept some for my fairy garden. candy cane – This came from my fairy garden stash and I just clipped it a little shorter for this. 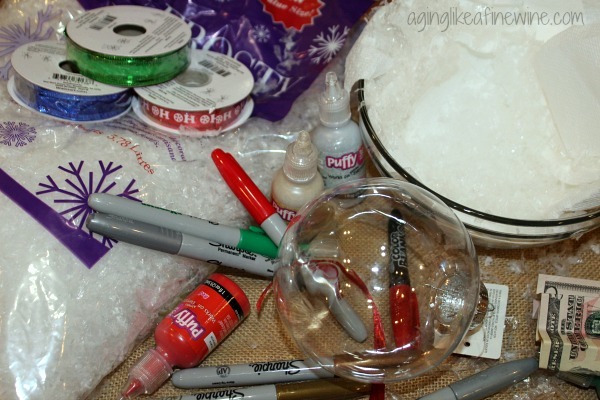 wrapped package – I had found a package of very small wrapped packages at Michaels and used them in my Santa fairy garden, so I removed one and used it here! bow – I found some earrings at Walmart that had a bow and bulb on them. I clipped them off and they were perfect for this project. 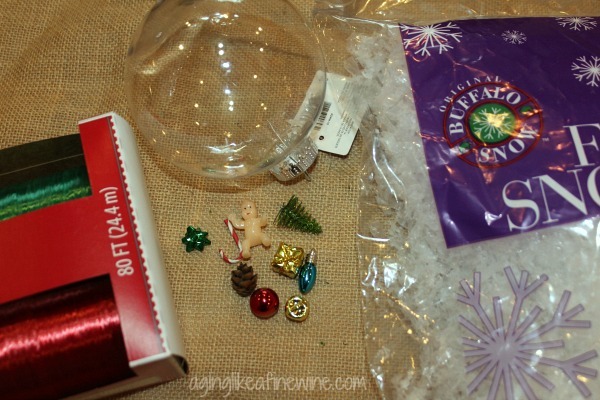 Christmas light bulb – This I also found on an inexpensive bracelet at Walmart and clipped one off. Christmas tree – To get one this small I bought a very inexpensive small tree in the Christmas decorations aisle (74 cents) and cut the top off for the tree. This gift package is made in the style of “Where’s Waldo”. The idea is to hide Christmas items in the snow that the recipient has to find! 1. Once again I used my homemade funnel and filled the bulb ornament with the fake snow. 2. I dropped in the tiny Christmas items. 3. Fold and drop in the cash you are giving. 4. Fill the rest with the fake snow. It needs to be full enough to hide the items, but not so tightly packed that the items cannot be shaken about and seen. 5. Put the silver top on. 6. Print the poem and punch a hole in the top. 7. Put your ribbon through the hole and tie it around the neck of the ornament. 8. Add a hook for hanging. 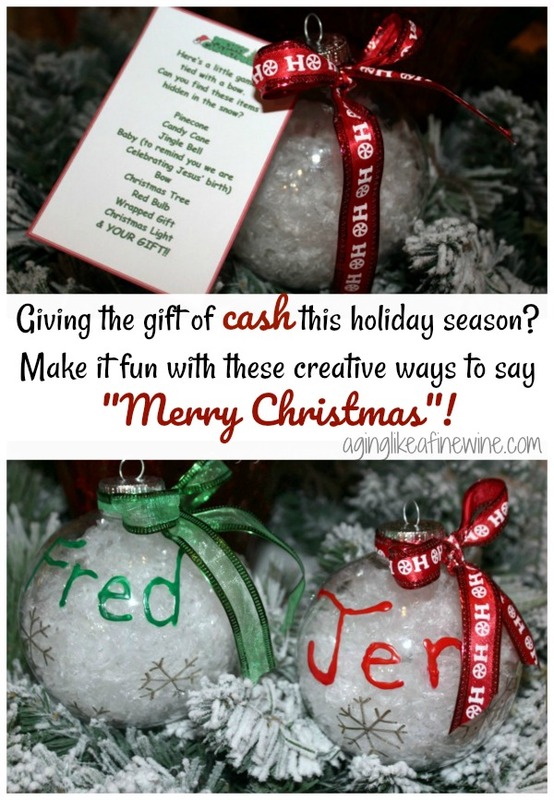 These are quick and easy to make and will add a fun challenge for the person receiving the gift as they try to figure out how to get their money out! I’ve included the tag for the Find It game right here so you can download and print it. 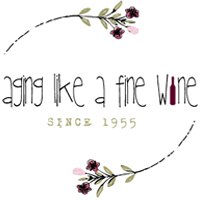 Be sure and visit both of them and check out their creations! Thank you once again for stopping by and reading! This post will be shared on link parties found on my “Where I Party” page! The links below are affiliate links. Which means if you click on the link and end up making a purchase, I get a small referral fee at no extra cost to you. It’s very much appreciated!